The two most important reasons to own high quality bonds in a portfolio are to provide diversification and to provide capital preservation. A catchy opening line, if there ever was one. Several big finance words (like diversification and preservation), an unexciting topic (bonds), and a subjective statement that may not seem to have actionable implications (but it does). Notably, the objective is not to defend bonds as exciting. In fact, such a defense of bonds would discredit the opening sentence – that their fundamental purposes are capital preservation and diversification. Few outside the quant world would describe preservation and diversification as exciting. The ambition here is to instead debunk some of the myths associated with these benefits because buying into them can have destructive financial implications. For instance, I recently spoke with an investor who was ready to give up on high grade bonds. Considering that bonds have an expected annual return over the next decade of roughly 3%, a negative year-to-date return in 2018, and failed to provide any real protection in October when the stock market suffered a sharp decline, why bother owning them when they’re not adding the intended value? The problem with this logic is that it associates recent results as a failure of the bond market when the reality is that recent results of the bond market are not unusual in any way. Again, the two most important reasons to own high quality bonds are diversification and capital preservation. No recent events discredit those benefits. But myths about what those benefits really mean and, importantly, what they don’t mean, can lead to value destructive decisions. 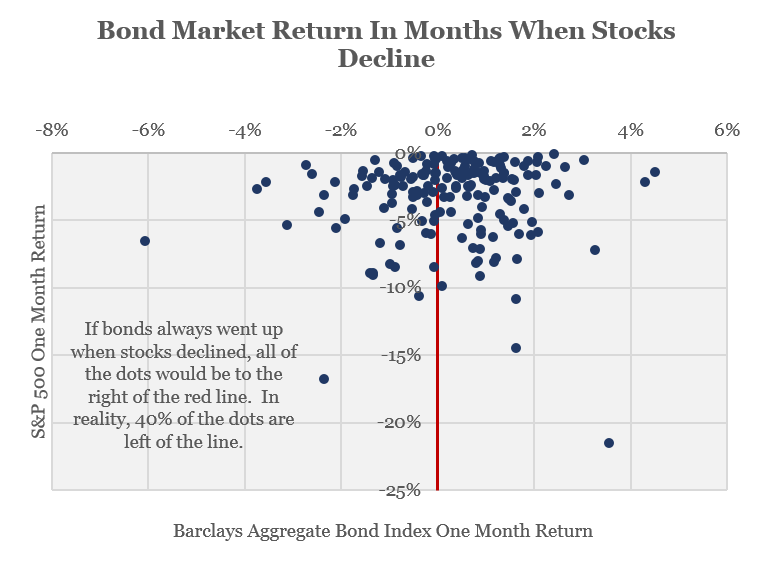 Myth 1: Bonds go up when stocks go down. Great concept…in theory. The reality is that bonds are not inversely correlated with stocks. In fact, the contrary is true – these two investment classes move in the same direction far more often than they move in different directions. Many investors generally think of bonds as safe and stocks as risky. And while this thinking may have some merit, it should not lead to the conclusion that one investment zigs while the other zags. In practice, there tends to be a strong causal relationship between stocks and bonds where a selloff in the bond market often triggers a selloff in the stock market. Consider the case where monthly employment and wage data come in far better than anticipated. These kinds of positive surprises often trigger declines in the bond market as investors fear that higher future inflation might erode the real return from bonds and/or cause the Federal Reserve to restrict money supply. Interest rates, which move inversely to bond prices, inherently move up as bond prices go lower. Contemporaneously, the higher interest rates pose a threat to corporate earnings by increasing company’s borrowing costs. Higher rates also pose a threat to stock valuations as future dividends will not be as valuable to investors in a world of competing higher bond yields. At the end of the day, the bond market retreat leads to a retreat in the stock market. Importantly, this is not to say that stocks and bonds will always move in the same direction. A geopolitical crisis, for example, often results in higher bond prices (as investors favor safe assets) and lower stock prices (as fearful investors sell risky assets). Alternatively, stronger than anticipated corporate earnings often causes stock prices to rise and bond prices to fall (as investors become more comfortable taking risk). So, although bonds can, and more often do, go up when stocks go down, the idea that bonds should increase when stocks fall is a blatant fallacy. History provides evidence. In all months since January 1976 (the inception of Barclays Aggregate Bond Index) when the S&P 500 Index has declined, bonds have similarly declined in 40% of those months. And it’s also not as if bonds are more likely to appreciate when stocks plummet. In the subset of those months where the S&P 500 loses more than 5%, the track record for bonds is even worse – declining 44% of the time. Myth 2: Bonds almost always go up, at least over periods of one month or longer. Bonds go up more often than down but investors should shed the myth that bonds rarely ever lose value. In fact, bonds have historically lost value in roughly 1/3 of all calendar months (31.9%) – not exactly supporting the “can’t lose” perception. Even more surprising to many, the winning percentage of bonds is hardly better than that of the stock market. Since 1976, the stock market has advanced in 64.4% of all calendar months compared to 68.1% for bonds. 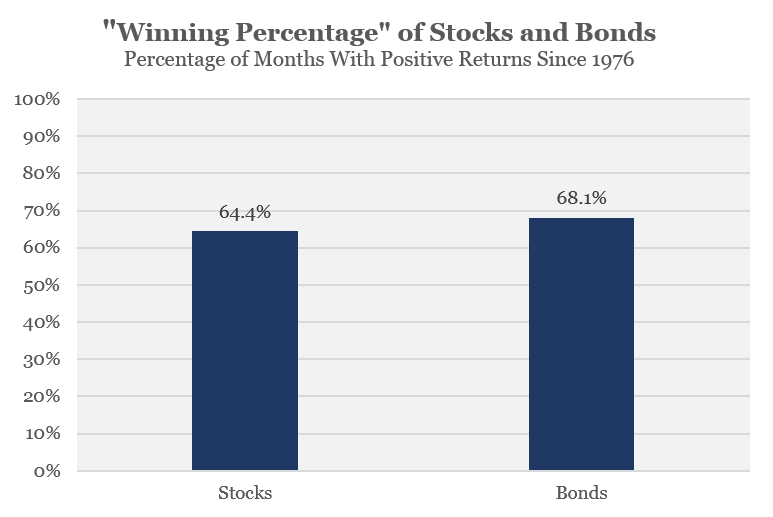 In more recent history (since Jan 2009), the stock market’s winning percentage actually beats that of bonds with the stock market win percentage at 71.2% compared with 65.2% for bonds. Skeptical investors tend to challenge this reality based on the idea that bonds pay regular income and have a maturity at which they pay back the par value. As a result, the skeptical theory goes, interim declines are not real. But this infers that what happens from month to month or year to year does not matter. If we use such misguided logic, then the stock market can effectively claim the same “never loses” moniker – as it has a 99.8% winning percentage over periods of 15 years or longer. The historic reality is that high quality bonds lose money almost as frequently as stocks. 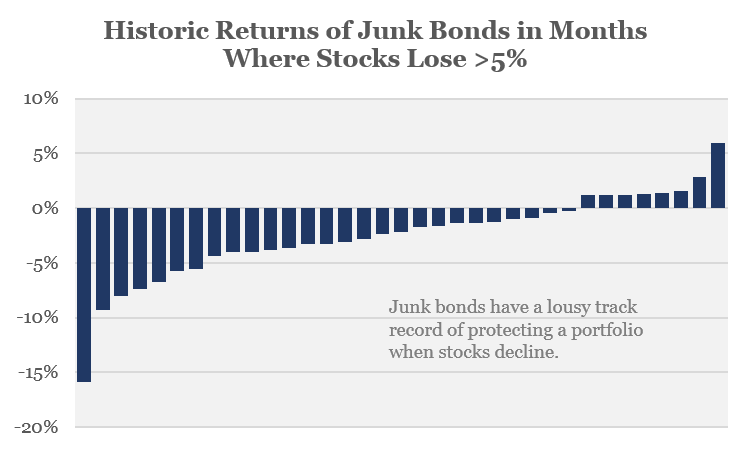 Myth 3: Because of their higher income, junk bonds provide useful protection when stocks decline. All bonds are not created equal. Not even close. Although they are still bonds, junk bonds (a.k.a. high yield bonds) behave far more like stocks than they behave like high quality bonds. The high positive correlation that junk bonds have with stocks actually means that they actually tend to worsen portfolio losses when paired with stocks rather than provide any protection. This can be empirically demonstrated in several ways. First, consider the correlation coefficient of stocks to junk bonds – a statistical measure of how closely two investments fluctuate together. A higher correlation coefficient (up to a maximum of 1.0) indicates that two investments tend to increase or decrease in parallel. Junk bonds have a historic correlation coefficient of 0.58 to stocks. Alternatively, their correlation coefficient to government bonds is only 0.09 which is to say junk bonds behave far more like stocks than they do like high grade bonds. Consider also how junk bonds behave during periods of stock market shock, which we’ll define as months in which stocks lose 5% or more. In 77% of those months, junk bonds also decline. The average return of junk bonds in such months is -2.5% – not exactly stock market protection. Conversely, government bonds fall in just 31% of these stock market shocks, providing an average return of +0.9% in such months. The point here is that when we talk about bonds providing stock market diversification and capital preservation benefits, we’re not talking about junk bonds. Junk bonds, really, provide neither of those benefits in a meaningful way. Point being: don’t point to junk bonds during a stock market decline and use their simultaneous decline as evidence that bonds failed to provide diversification or preservation benefits. One more time: the two most important reasons to own high quality bonds are diversification and capital preservation. That does not mean that bonds always zig when stocks zag or that they always make money. It means that, over the long run, adding bonds to stocks in a portfolio will mitigate the downside losses and will lead to more consistent returns. If either of those benefits are desirable, then reducing an allocation to high grade bonds because of erroneous myths has the likely potential to provide undesirable outcomes in the future.